Oh…it’s another Thursday and we have been ‘rockin’ it’ over on Create with Connie and Mary Holiday Collection 2014! We just started so it’s a GREAT time to SUBSCRIBE! And since it is Thursday, it is time for another Create with Connie and Mary Thursday Challenge! This week – we have a fun sketch challenge for you! Gold Foil – 3 3/4 x 3 3/4 (NOTE: I cut out the middle leaving a 1/2″ frame around it then attach the frame behind the panel). Add tag to card to finish it off. 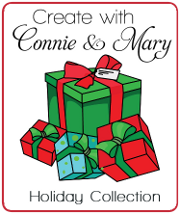 We have just started the Create with Connie and Mary Holiday Collection 2014 where we are featuring the Christmas/Holiday (no Halloween/Fall) products from the Holiday Mini! the Collection runs for 4 weeks – 24 AMAZING projects that are perfect for your holiday classes and camps and gift giving! Our design team is AMAZING and you don’t want to miss out! It’s not too late to join so head over to Create with Connie and Mary to learn more and to subscribe today! This entry was posted in Clean and Simple (CAS), Create with Connie and Mary and tagged Letterpress Winter. Bookmark the permalink. Elegant and beautiful card! 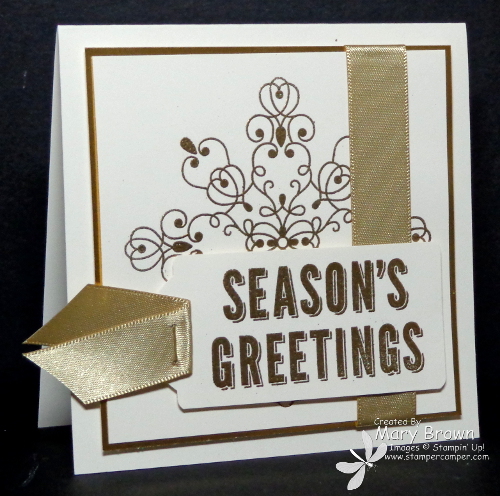 I was happy to read that you cut out the center of the gold foil layer to conserve on this beautiful card stock. Also love the clever idea of coloring the silver staple with gold! Clever lady! Gorgeous! I love that this would be easy to mass produce and is very mailable! Very elegant and beautiful! Love it! Your card is beautiful!! The gold and vanilla are so elegant together; love that you used a 1/2″ frame of the gold for your layer.. smart gal!! GOLD, GLORIOUS GOLD! So elegant and beautiful! What a rich looking card! I love the Very Vanilla and gold together, so beautiful!